I realise I've become a terrible blogger. With the best intentions in the world, I just never seem to get around to writing any of the things I intend to (that'll be my jet-set lifestyle getting in the way). So I've decided the best thing to do it adopt a 'little and often' approach. So here's a little for you, to get the ball rolling. We're just approaching the first summer in our little house in the countryside, and I'm delighted to have discovered a well established vine growing in the garden. 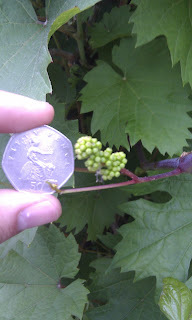 The last week or so has seen the emergance of a few tiny grapes (see below). For any American readers, a 50p is just a little bigger than a quarter. At a rough count, I think I've got about 50 of these little bunches. Nevermind 'single vineyard', this is going to be a single vine wine! It may well be terrible, but I'll have fun finding out, and will keep you informed of the progress.